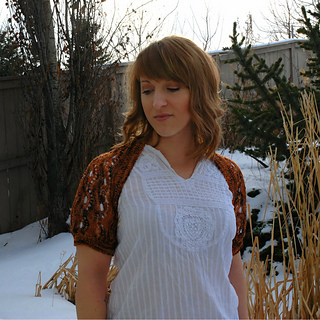 Women’s Small (Medium, Large) To fit bust size 32-34” (36-38”, 40-42”). 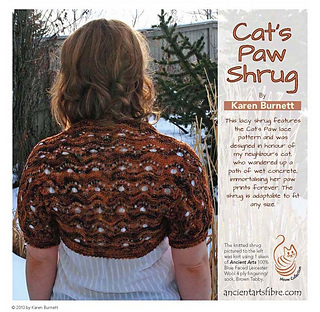 This lacy shrug features the Cat’s Paw lace pattern and was designed in honour of my neighbour’s cat, who wandered up a path of wet concrete, immortalising her paw prints forever. 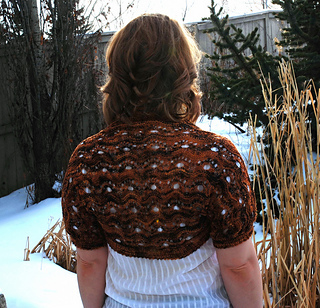 The shrug is adaptable to fit any size; to create a custom-sized shrug, measure the width of your back and add 15cm/6” for the cap sleeve, then multiply by the number of stitches per inch in your swatch and cast on that many stitches.